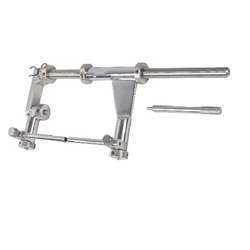 We are engaged in manufacturing and supplying a wide range of Spinal Surgery Instruments. These ranges of products are made by using best quality of raw material. Offered ranges are durable and reliable which fulfill the demands of the clients. 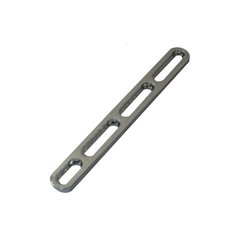 We are well known in medical spinal surgery instruments suppliers offering them at market leading rates. We are leading manufacturer and exporter of orthopedic implants and orthopedic instruments i.e. Steffee Plate. Recommended by top doctors and hospitals, our steffee plates are made of A grade material and is naturally cent percent safe. We are engaged in the manufacture and supply of world class quality Out Trigger Distractor. Due to various salient features of our products such as highly durability, cost effectiveness, corrosion resistance, tensile strength etc. , our products are highly acclaimed worldwide and able to cater to the needs of various sophisticated hospitals all over the world. These are manufactured under the able guidance of our highly qualified professional and technical experts so as to ensure that these are as per industrial standards. Having earned a distinction in surgical instrument manufacturing, our Distractor for Steffee Plate System only represents our quality. With state of the art design and smoothness, this important instrument is delivered with utmost care. 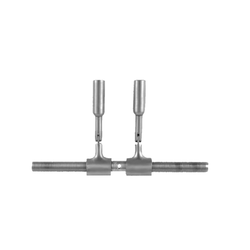 Looking for “Spinal Surgery Instruments”?